You probably have a Wi-Fi router, and you might have a smart home hub of some sort as well. Why not make those devices the same thing? That's Samsung's latest router, which it calls the SmartThings Wifi. This replaces Samsung's old Home Connect router with SmartThings integration. This time, Samsung's system has Mesh networking thanks to a partnership with Plume. The old Home Connect could work in a mesh if you bought multiple units, but the system wasn't really designed with that in mind. SmartThings Wifi comes in single and three-packs ($120 and $280, respectively). The technology licensed from Plume balances network load and manages interference. Plume has its own mesh Wi-Fi system, but it's also licensed its technology to several other companies. In addition to being your router, the SmartThings Wifi has Zigbee, Z-wave, and Bluetooth 4.1 connectivity for controlling smart home hardware. It ties into the Samsung SmartThings platform to support cameras, power outlets, motion sensors, lights, and so much more. Separately, there's a new standalone SmartThings hub ($70) that connects over WiFi rather than ethernet. The Samsung SmartThings Wifi and updated hub should begin hitting various online retailers today. Samsung has the 3-pack listed right now, and Fry's has both single and three-packs. Newegg has both (single and three-pack) listed, but they're not in stock yet. 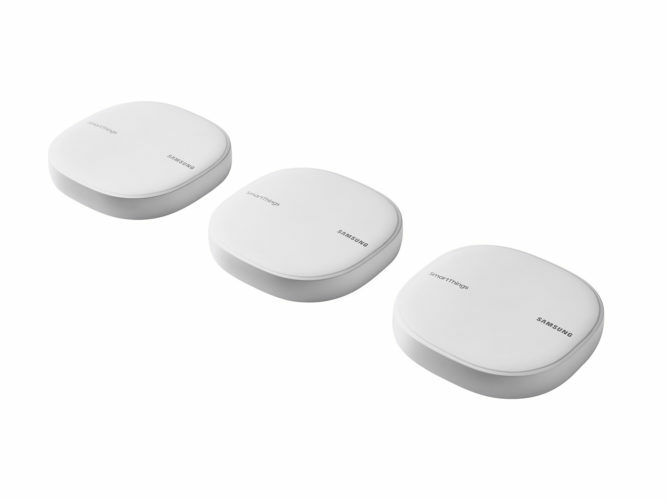 RIDGEFIELD PARK, N.J.--(BUSINESS WIRE)--In an effort to eliminate the dreaded Wi-Fi buffering zone and prevent streaming latency, Samsung Electronics America, Inc. today announced its new SmartThings Wifi mesh network system. Equipped with AI-based mesh Wi-Fi technology from Plume and a built-in SmartThings Hub, the system delivers an intelligently optimized whole home network with the added value of complete smart home control throughout every room of the home. Reliable and secure Wi-Fi is a fundamental need for consumers today, and internet use is no longer limited to the home office or location where the router is based. As more connected technologies enter the home, there is a greater need for a stable network that can efficiently support these devices. The SmartThings Wifi system not only delivers this stability, but also delivers fast and consistent coverage that covers the whole home. Samsung partnered with Plume to integrate its AI-based mesh Wi-Fi optimization into SmartThings Wifi. The Plume platform adapts to internet usage in the home and intelligently allocates bandwidth, mitigates interference, and delivers maximum Wi-Fi capacity across the home, accounting for every connected device and selecting the optimal band and frequency channel so users can get the fastest speed possible. Plume’s technology can optimize a home network across multiple devices so parents working from laptops can download files while kids stream TV, and gamers experience speed and reliability even when others are on the network. Now, Wi-Fi goes where the need is instead of the other way around. Users can also set parental controls to manage screen time and set-up special logins and passwords for guests using the Plume HomePass® feature. SmartThings Wifi works as a SmartThings Hub to serve as the “brain” of the smart home. Samsung’s open SmartThings ecosystem makes it easy to automate and manage the smart home with one hub and the SmartThings app. Compatible with hundreds of third-party devices and services, SmartThings enables users to expand their smart home with lights, door locks, cameras, voice assistants, thermostats and more. SmartThings Wifi delivers a simple, convenient 2-in-1 solution, offering whole-home automation out of the box. For corner to corner coverage, users can choose the right Wi-Fi configuration to fit their needs, from a home with multiple levels to a small apartment. Each SmartThings Wifi router has a range of 1,500 square feet, with the 3-pack covering 4,500 square feet, and users can expand coverage by adding additional mesh routers to the set-up. It is easily set-up and managed by the Android and iOS compatible SmartThings app. The SmartThings Wifi 3-pack retails for $279.99 and the single device retails for $119.99. It is available starting today on Samsung.com and at retailers nationwide. 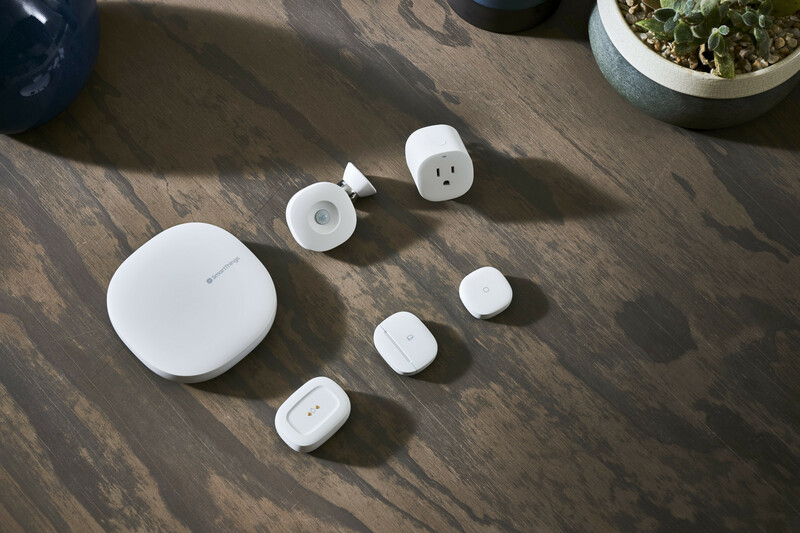 In addition to SmartThings Wifi, Samsung is upgrading the performance and connectivity of its SmartThings Hub, Water Leak Sensor, Motion Sensor, Multipurpose Sensor and Smart Outlet to give consumers more choice in their smart home set up. The new, more compact SmartThings Hub has been upgraded with the latest Zigbee, Z-wave, and Bluetooth 4.1 connectivity protocols. Now, the Hub can wirelessly connect to a Wi-Fi network, no longer needing a dedicated Ethernet cable, so users have the flexibility to place it anywhere in their home. The SmartThings Motion Sensor is additionally redesigned with a magnetic ball mount, so consumers can adjust the tilt angle for a wider view range to detect motion and trigger automated events. Samsung is also introducing the new SmartThings Button with programmable triggers that manually control routines around the home - like setting Movie Mode - without having to go into the SmartThings app. The SmartThings Button, like the rest of the SmartThings sensor line, monitors temperature in an area of the home, such as basement or baby’s room, and signals the smart thermostat to adjust automatically. The new SmartThings Hub ($69.99), sensors ($19.99 - $24.99), Button ($14.99) and Smart Outlet ($34.99) are now available on Samsung.com and at retailers nationwide.